Since I’ve had many requests over the years asking about what guitar I use, I thought I’d write a little about each of them. I spend a lot of time with my guitars. I think possibly as much (or possibly more) than with most people. Because playing music is often an intense emotional experience the relationship between us has become fairly intimate over the years. They express some of my highest highs and lowest lows. How could I not treat them respect, and perhaps a hint of reverence, for their individual personalities and role they have played in my life. Ah – my first real love. If I were to say one of my guitars are my favorites this would be it. I find inspiration in it’s rich resonant tone. This is my “negra”, flamenco negra to be exact. Handmade by Lester Devoe, famous for making guitars for Paco deLucia, Ottmar Liebert and Vicente Amigo to name just a few. The negra part comes from the back and sides. Being made from a dusk colored Rosewood it’s darker than the traditional flamenco guitars which are usually made from the blond cypress wood. The top is made from a solid piece of Spruce personally hand picked by Lester on his trips to Spain and other countries where he carefully selects the premium woods for his world famous guitars. Usually a guitar like this with a Spruce top could take years of “breaking in” to give up it’s ultimate tone. I was on a 2 year waiting list, but after a few months, by a small miracle, Lester agreed to sell me a guitar he had been showing off to people who wanted to test his workmanship. I was lucky, or I like to believe chosen. It’s sound spoke to me from the first time I played it and I knew she was “the one”. This is actually the guitar I play the most. I find it’s bright warm sound cuts through when I play live. It’s nickname comes from it’s light colored cypress back and sides and blond spruce top. Blondie was handmade for me by Jeff Sigurdson out of Abbotsford, B.C. in Canada. Blondie is a more traditional flamenca blanca. The tone is clear and crisp, especially great for the percussive rhythm sound of flamenco. I’ve had Jeff install a B-Band pickup in it so I can use it without a microphone.This really cuts down on feedback and makes it easy to get up and running at live performances. I’ve had many guitars in my life. Some were great, and other not so much. There is something special about the first real quality handmade guitar I bought that I’ll never forget. Kinda like a first love. 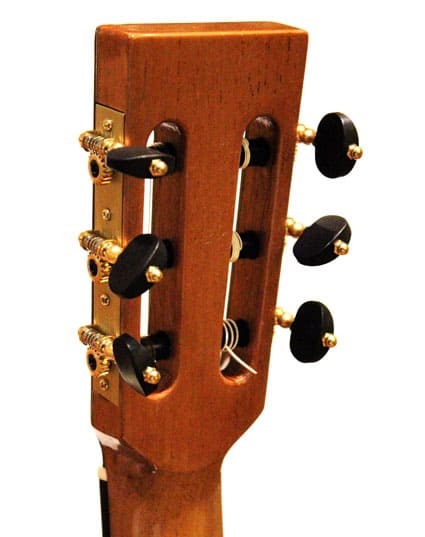 My first “beauty” was born in the workshop of Luthier Richard Prenkert, best known for his classical guitars. I had played one of his flamenco blancas that was hanging on the wall at Guitar Solo in San Francisco and liked it. I called him and asked if he would consider making me a guitar similar to the one I played but with Rosewood back and sides. He agreed and I became the proud owner of his first flamenco negra. The guitar is a hybrid between a classical guitar and flamenco guitar. It doesn’t make it into my recordings as often as the first two, but I’ll usually pull it out when I want to play a fingerpicking passage or solo piece that would benefit from it’s relatively full tone. When I first played this guitar I had the sensation that I can only imagine someone has when they drives a Mercedes for the first time. There’s no going back. Though there’s a few minor scratches and nicks in this “beauty”, the sound has only gotten better over the years. My newest addition to the family brings a bit of mystery as to her origins. As I was strolling through the annual NAMM trade show recently (National Association of Music Merchants) I came across a small booth in the lowest level that had two guitars, and only two. It was the last few hours of the show and it’s common for vendors to sell off some of their instruments to avoid having to carry them back. I’m not usually interested in buying stuff at the show, but these two got my attention. They looked beautiful, and they had a handwritten sign on them that said they were for sale. With more than a tinge of skepticism I picked up one guitar and played it. It sounded great! An attractive Chinese women explained that they are both handmade in China and they are testing to see if they have a market for them. I played the other…different, but equally rich and melodious. I wanted them both! I pulled out my credit card, but they could only accept cash. I ran to the ATM only to be confronted by a long line. I guess I wasn’t the only one that was making last minute purchases. After a frustrating 30 minutes, I returned with cash in hand just in time to see another guitarist pulling out cash to purchase one of the guitars. Only slightly disappointed I paid for the other. In the excitement I never did get an answer as to who made the guitar. Since then I’ve emailed the vendor to find out more about the guitar. It has no information in the soundhole like most guitars. Who made it? Where was it made? Silence. I’m not sure what to think. It’s the guitar I practice on most now, probably because it’s new and different. Let’s see if it finds a permanent place among my families of beauties. What do you think? Should it matter whether or not I know the maker or birthplace if the guitar sounds good? P.S. Please take my allusion to the female gender in referring to my guitars lightly. I am an artist type after all. Thomas, I always like reading and hearing what you have to say, I miss having lessons with you a while back, your that very kind and patient teacher. Keep up the great work and thanks for sharing. All beautiful guitars, Tomas! Thanks for sharing. 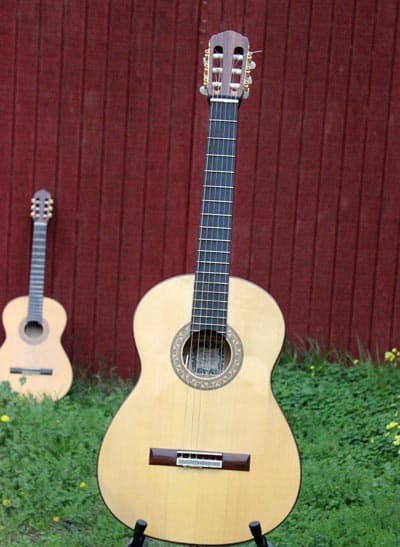 When I was studying classical guitar in San Diego about 45 years ago my instructor and I went to Tijuana, Mexico where he introduced me to Fermin Ducan, guitar maker. For $200 Senor Ducan built me a very nice guitar, which, unfortunately, my oldest son left at school one day, never to be seen again. (The guitar – not the kid!) I had left it behind for him to practice on when I left for Alaska to work for an indefinite period of time. It was a sad ending for my wonderful guitar, and an even sadder ending to my marriage. Long story of which I have many regarding my life. I hope to retell it in a fictionalized version of my life in novel form, possible even a film script. I’m sorry to hear losing that guitar and of course for the sadder ending of your marriage. I hope you’ve moved on from that sad marriage experience and is living a happy and beautiful life now. I’m just curious if you’re still playing guitar now. If not, why not try it again. It’s one of the best source of enjoyment. It can be your outlet of whatever emotional stress you might have now. Oh, do I sound a counselor? I hope you don’t mind. Thanks for sharing your thoughts. Tomas has free video lessons in YouTube or to make it easier for you, find it here https://tomasmichaud.com and get lots more tips and real guitar lessons. This is his blog site. Your beautiful guitars. They are absolutely beautiful. I hope someday when I become a better player to have a guitar like yours. For now as a beginning guitarist I love my Manuel Rodriguez C1V solid cedar top guitar. They are not as nice as yours but I still love mine just because it’s mine and it’s my first. I think that if I ever get good at playing guitar and eventually purchase a hand made one, this first guitar will always have a special place in my heart. It’s the guitar that’s helping me to learn. Again, thank you for sharing the love of your guitars, I know how you feel about them. Thanks for reading my blog. I was so inspired doing that post – sharing my 4 beauties, amazing. 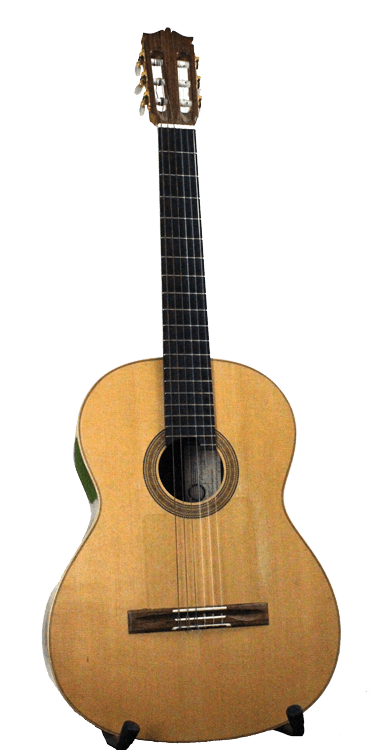 I do understand how you valued your Manuel Rodriguez C1V solid cedar top guitar, it is such a wonderful guitar Alfredo. Our first guitar will always be very sentimental to us and even I myself considered my first as my first love :), the rest is history. What fun hearing your guitar stories, Tomas. Your ties to those superb instruments are deeply personal…I am betting that they even smell differently! I know that my Alhambra has a distinct and pleasant aroma.